The Spector Office Building is centrally located, offers free and ample parking, along with amazing views of Sarasota for you, your employees, and valued clients. Are you looking for a convenient office space for rent in Sarasota, Florida? Privately owned and managed on site, this nine-story premier brick office building is conveniently located in downtown Sarasota between Fruitville Road and Main Street. This provides easy access to I-75 via Fruitville Road and a few blocks to the courthouse. Tenants and guests are just minutes from places like Whole Foods, local government offices and the area's finest restaurants and shops. Discover commercial office spaces ideal for Sarasota based businesses: attorneys, CPAs, Marketing Firms, and Financial professionals. Between the East and West towers there are over 500 spaces of covered parking for employees and your valued clients. The well-appointed offices located on floors 7 – 9 surround two lush courtyards with peaceful views of trees, fountains and flowers. Both towers are joined by a single elevator core, which opens onto a spacious marbled and glassed lobby with views of Sarasota. Ideal for a small law firm, start-up, or architectural firm, Suite 880 in The Spector Building offers you a unique opportunity to grow your firm while enjoying work every day. Looking to move your growing company from a one-man operation to a staff of five or more? Check out this set of deluxe office suites centrally located in Downtown Sarasota. 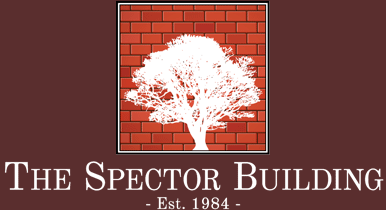 What other office buiding in Sarasota offers you, your employees, and visiting clients as tranquil an environment as what The Spector Building offers? Each tower features a uniquely designed brick paved courtyard teeming with fresh flowers, foliage, and trees. Indeed, lunch and work breaks will never be the same.